What makes Plastic Jars a Great Packaging Choice? 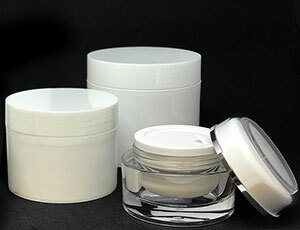 Plastic Jars are great for food, pharma, cosmetic, industrial and personal care use. Sizes range from ¼ oz. up to 336 oz. and come in round, square and oblong shapes. Like plastic tubes, jars are available in a variety of materials including Polypropylene (PP). High Density Polyethylene (HDPE), Polyvinyl Chloride (PVC) and Polyethylene Terephthalate (PET). Single Wall Plastic Jars are made from one piece of plastic. They are available is a variety of colors and sizes but all have wide mouths, straight walls (sides) and have continuous thread neck finishes. Single Wall jars are economical and are a good choice when cost is key and barrier properties are not paramount. Double Wall Plastic Jars combine an inner jar with an outer shell to make a symmetric appearance. They have better barrier properties than single wall jars making them a good packaging solution for cosmetics, bath products, HBA (health and beauty aides) and oil based foods. They can be made with Polypropylene (PP) inners and polypropylene (PP) outers or with polypropylene (PP) inners and polyethylene (PET) outers. Both are durable choices with good barrier properties. Get industry insights, tips, and exclusive content through our newsletter. *Privacy is important to us. We do not sell, divulge, or distribute your email address.